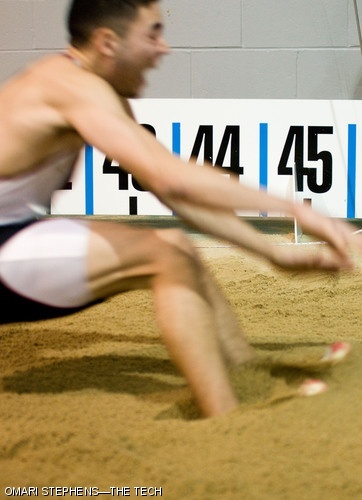 Anthony D. Teixeira ’08 lands in the sand at the end of a 13.53-meter (44’ 4.5”) triple-jump. Teixeira finished 7th in the event with a jump of 13.85 meters (45’ 5.25”). The MIT men’s track and field team finished 3rd in the New England Division III championship meet with 101 points, behind Williams College (106 points), and Tufts University (118 points).